Following the message in Gilli Moon's book "Just Get Out There", this workshop is a candid and intimate hour with Gilli, for Artists and Musicians, to Achieve Success and Self-Empowerment as a Warrior Artist Entrepreneur. Filmed live with Gilli Moon at the Taxi Road Rally (Songwriters Conference), Los Angeles - you get to watch it at your pace, in your own time, online (video series). Run time 1 hour 9 mins - but we've broken it up into smaller video chunks to digest easily. What would happen if you just took a leap of faith in your Artistry and just got out there? Are you ready to take risks in order to achieve your dreams? Are you ready to build a plan for yourself? Are you ready to see your dreams come true? 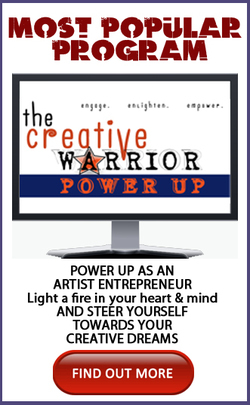 In this new dawn of the entertainment business, achieving abundance, self-empowerment and professional success means being a Warrior Artist that is unique, in charge of your own destiny and entrepreneurial in business and in thought. By just getting out there, you are taking the steps towards realizing your dreams. Artists need to be business savvy, and self-driven. You can achieve much, without waiting for someone else to come along and make it happen for you. Fame is an illusion in this new world. It’s created, bought and lasts for moments. What you want to create is a FULL and ENRICHING LIFE as a consummate Artist and that takes diligence, integrity, talent, perseverance and a go get ‘em mentality. This means being a Warrior Artist, and being an Artist Entrepreneur - in charge of your own destiny, pursuing creative freedom, and at the same time being very disciplined and diligent in your pursuit of excellence. It begins with getting clear with who you are and what you want, creating clear and tangible goals, finding the joy, defining success on your own terms and putting one foot in front of the other. defining success on your own terms. all the while achieving personal, financial and professional success and joy though her anecdotal stories (some about her personal life), spiritually inspirations and real, practical, tried and tested strategies. In order to be powerful as an artist, you have to be very business artist. You need to be very self driven and business savvy. You don’t need to know everything about the business (you can go to experts for advice) but you are in control. If you want it to be life long, you have to be a visionary. You have to be able to think outside the box and “feel” it inside. A lot of inner work is required. So while you are working on your craft and techniques on the outside, you have to work on your mindset on the inside. Building a plan and executing it. As you watch this, you’ll ask yourself some deep questions on who you are and who you want to become, as well as your goals and dreams.